CHICAGO, IL—(ENEWSPF)–May 26, 2017. Today, U.S. Senator Tammy Duckworth (D-IL) met with AmeriCorps members from College Possible – a program designed to prepare students from underserved communities for college – to discuss her efforts to promote national service and make higher education more accessible for all Americans. Duckworth also announced over $15 million in grant funding from the Corporation for National and Community Service (CNCS) to support Illinois AmeriCorps members. A photo of the event is available here. Duckworth has been a champion for public education since she was first elected to Congress. As a Congresswoman, she introduced the In The Red Act, which would strengthen Pell Grants and make community college tuition-free for deserving students to help prepare them for high-skilled jobs. In the Senate, she helped introduce the Community College to Career Fund Act (CC2C) to close the “skills gap” by creating a grant program to fund workforce training partnership programs between colleges and employers to help prepare Illinois students for jobs in high-demand industries, such as healthcare, advanced manufacturing, clean energy and information technology. Throughout her personal and professional life, Duckworth has also been a strong advocate for the expansion of national service opportunities for all Americans. 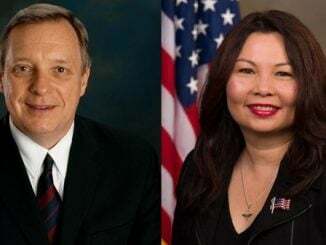 Duckworth served in the Reserve Forces for 23 years and continued to serve her fellow Veterans as Director of the Illinois Department of Veterans Affairs and then as Assistant Secretary of the U.S. Department of Veterans Affairs. Throughout her career, she has also made a point of volunteering with community partners at local schools, food pantries and community centers. Last year, she introduced the 21st Century American Service Act to increase service positions available through civilian national service organizations and ensure all young Americans are informed of the opportunities available to them. She plans to continue working to expand service opportunities for young Americans across the country in the Senate.